The discount offer will expire at 11:59pm GMT, Monday 26 November. 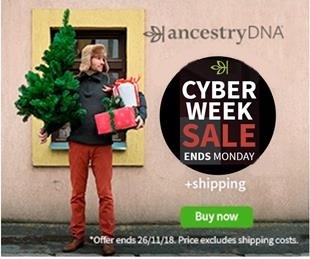 There may be no Thanksgiving to celebrate on the eastern shores of the Atlantic, but Ancestry DNA has come up with a Cyber Week Sale for researchers resident in Ireland and the UK. And it's a great sale, too, with the lowest prices of the year to tempt you to test with the world's largest consumer DNA network. The price for Irish residents is €55, a saving of €40, while the price for UK residents is £49, a saving of £30. As always, shipping is extra. Save €40! Regular price €95. Sale price €55. Plus shipping.